Fixed-rate Falcon JK/JKU Nexus EF 2.1 Steering Stabilizers improve steering feel on daily-driven Jeeps in a compact and affordable package. Falcon shock absorbers and steering stabilizers are engineered to meet the unique requirements of the JK Wrangler/JKU Wrangler Unlimited. These Jeep-specific steering stabilizers deliver a properly weighted steering feel and consistent bi-directional turning for balanced and controlled side-to-side steering response and an equal return to center dynamics. • Fixed-rate damping optimized for on- & off-road driving. • NOT compatible w/ TeraFlex High Steer Systems (# 4391000 or # 4390975 or # 4390875). • The Falcon Nexus EF 2.1 Steering Stabilizer is also available to fit the stock 1-3/8” tie rod (# 01-02-21-110-138). • An adjustable Falcon Nexus EF 2.2 Fast Adjust Steering Stabilizer is also available for the stock 1-3/8” tie rod (# 01-02-22-110-138) or a HD 1-5/8” (42mm) tie rod (# 01-02-22-110-158). There is NO equal, and there is NO compromise on quality! 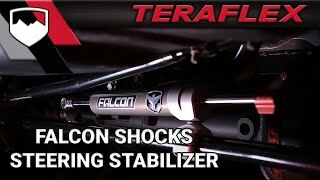 Teraflex has taken it to the next level with the Falcon series. There's no valid reason to compare the factory components to the Falcons either, it just makes sense, upgrade now and be done. They are rebuildable so it's literally the last set you will have to buy! Installation couldn't be any easier, really no different than installing any other set, they just look way cooler!